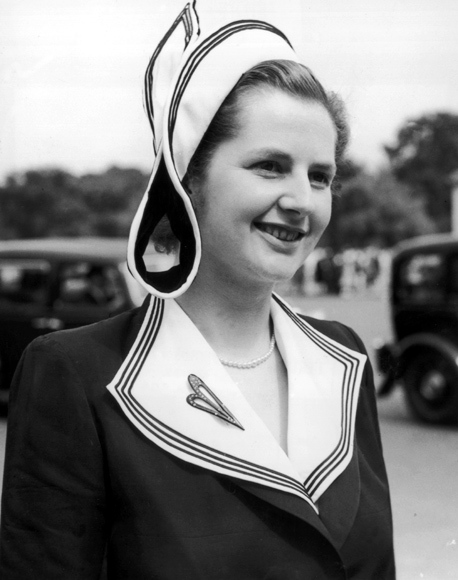 Former British prime minister Margaret Thatcher was the country's only female premier. She was a towering figure in post-war British and world politics. Rediff.com takes a look at the legacy of one of the most influential political figures of the 20th century -- her extraordinary life and career. 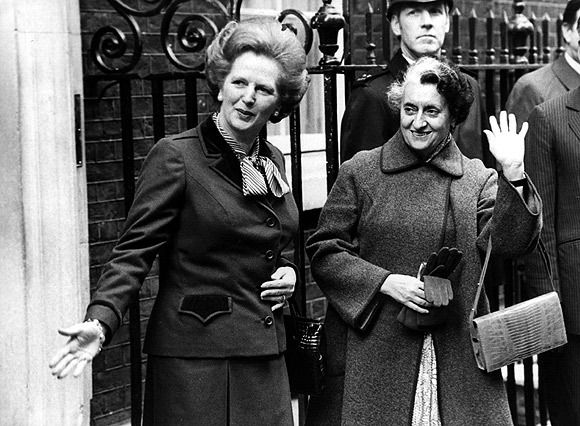 British Conservative Prime Minister Margaret Thatcher with then Indian premier Indira Gandhi (1917 - 1984), outside 10 Downing Street in this March 1982 pciture. Thatcher is welcomed at Delhi's International Airport by the then Indian PM Rajiv Gandhi. Also seen in the picture (right) is Sonia Gandhi. 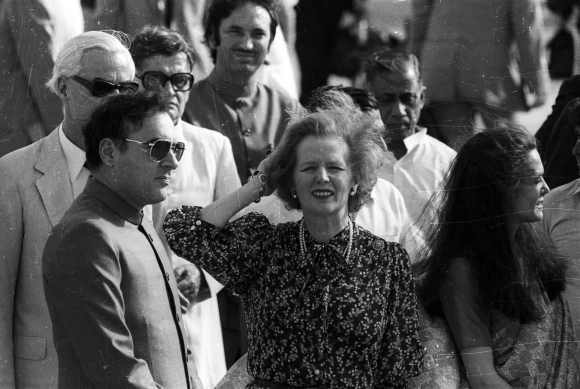 Thatcher's visit to India marked the last leg of her six-nation tour on April 13, 1985. 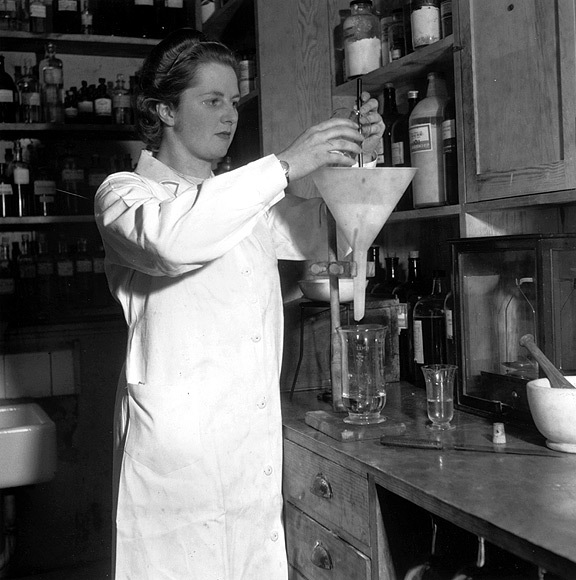 Conservative Party candidate, Margaret Roberts (Margaret Thatcher), the youngest candidate for any party in the 1950 General Election, at work in a laboratory where she is a research chemist. 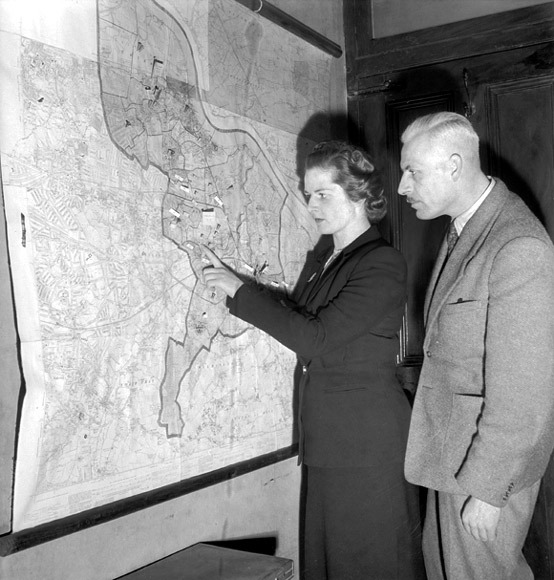 Margaret Roberts, later Thatcher, the youngest candidate in the Conservative Party, plans her election campaign on January 1, 1950. 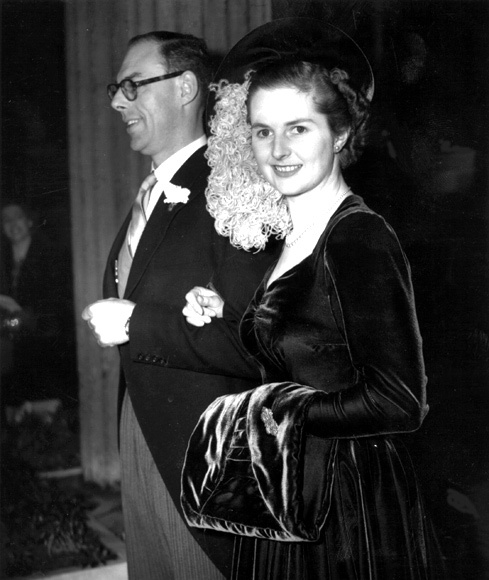 Thatcher, nee Roberts on her wedding day (Dec 13, 1951) with husband Denis (1915 - 2003). The dress was in royal blue velvet, the halo-styled hat was trimmed with ostrich feathers. Thatcher outside the House of Commons, where she is taking her seat as the Member of Parliament for Finchley, 20th October 1959. 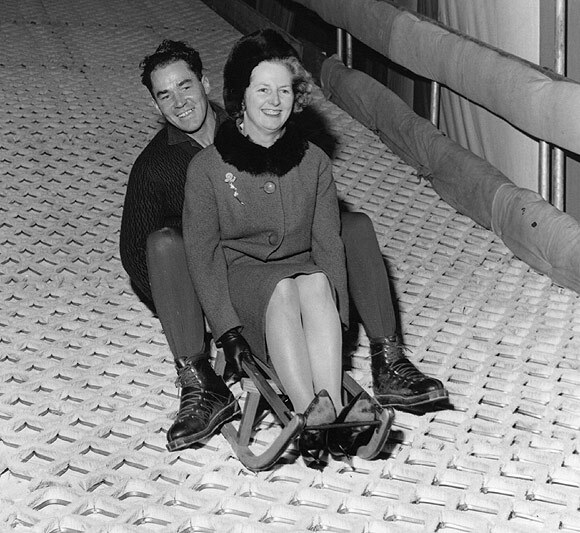 Thatcher has fun on a ski run in Battersea Park with instructor Joe Hoki in this December 1962 picture. 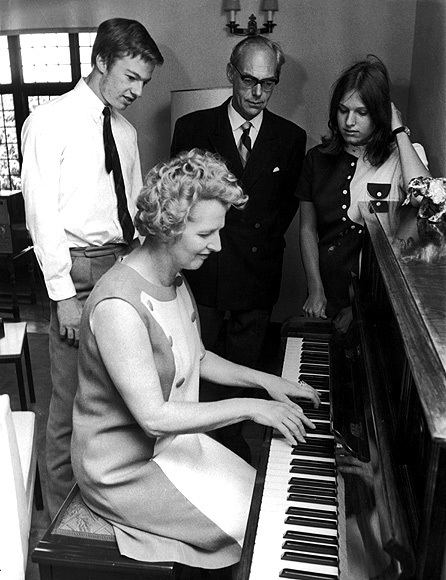 The Secretary of State for Education and Science Thatcher plays the piano for husband Denis and their seventeen year-old twins children Mark and Carol on September 5, 1970. 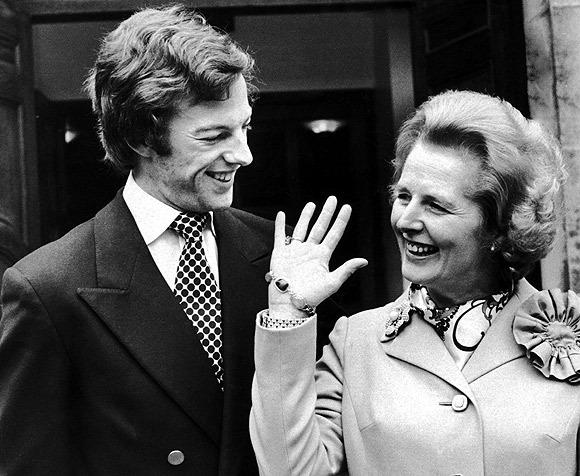 Thatcher celebrates her victory with her son Mark, then 21, after being newly elected as MP for Finchleywith, October 11, 1974. 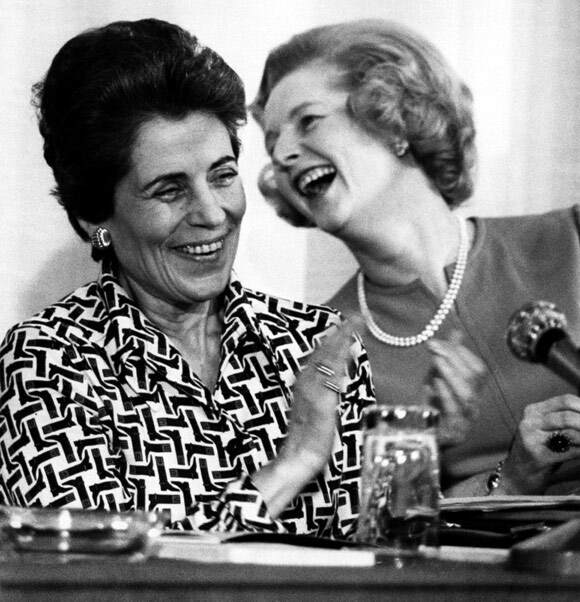 French Minister for Women's Affairs Francoise Giroud (1916 - 2003) with Thatcher at the 'Women And Power' conference, held at the New London centre, Drury Lane, London on April 24, 1975. Thatcher, then Miss Margaret Roberts, attending a garden party at Buckingham Palace, as a Conservative MP. 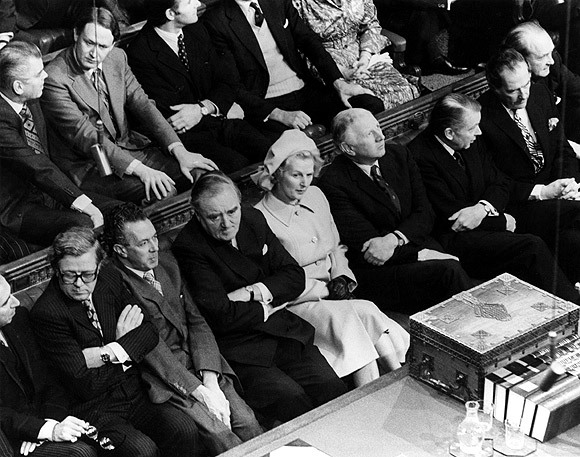 Members of the British Conservative Party Shadow Cabinet on the opposition front bench in the House of Commons, Westminster, London, during the State Opening Of Parliament, November 24, 1976. Front row, left to right: Geoffrey Howe, Keith Joseph (1918 - 1994), William Whitelaw (1918 - 1999), then Leader of the Opposition Thatcher, James Prior, and Francis Pym (1922 - 2008). 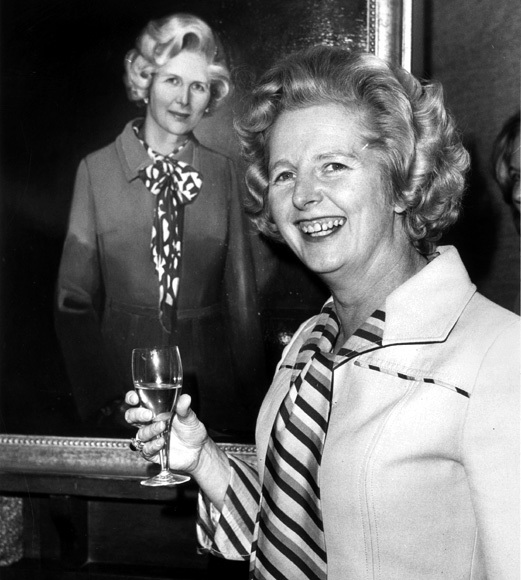 Then the Leader of the Conservative Party, Thatcher, celebrating her 50th birthday on October 13, 1975. She stands in front of a new portrait by Andre Moller at the Windes Lodge Gallery in London. 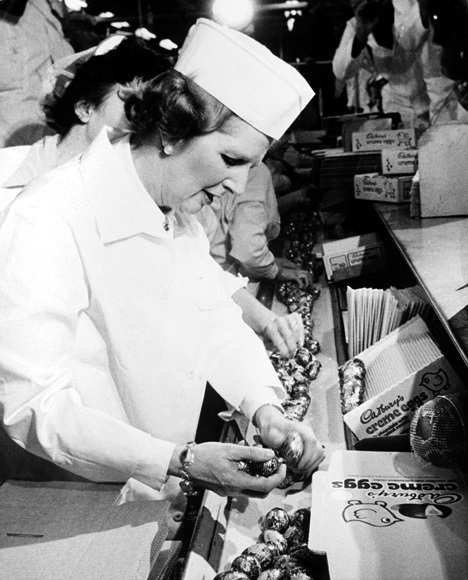 Thatcher packing Creme Eggs on a visit to the Cadbury factory in Birmingham during her election tour of Britain, 20th April 1979. 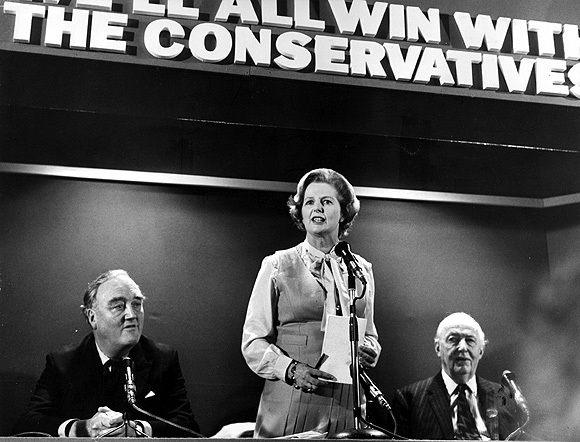 The then Leader of the Conservative Party, Thatcher, addressing the Tories at the start of the 1979 general election campaign. To her right is William Whitelaw, a Conservative Party politician who served in a wide number of cabinet positions, most notably as home secretary and deputy prime minister. 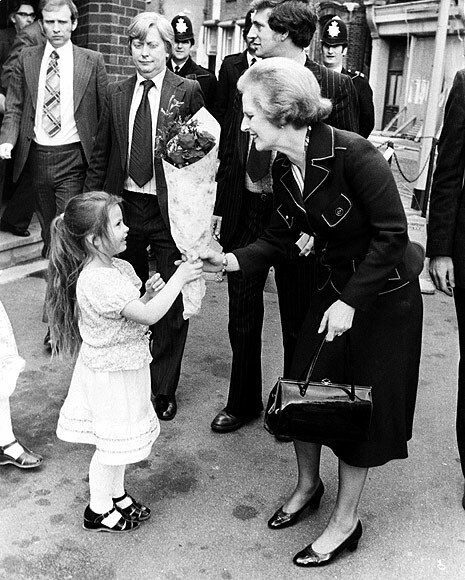 Thatcher receives a bouquet of flowers from four-year-old Nancy Turner, as she leaves the Greenwood Theatre on Weston Street, London, April 30, 1979. She has just appeared on 'World in Action: The Granada 500' alongside fellow party leaders James Callaghan and David Steel, answering questions on the forthcoming general election. 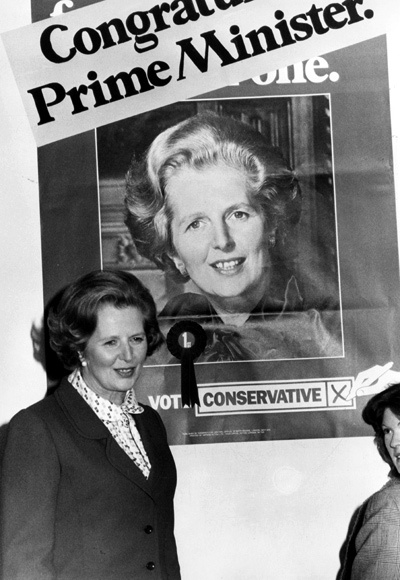 Thatcher, the first woman to hold the office of prime minister of Great Britain (1979 - 1990) next to a campaign poster. 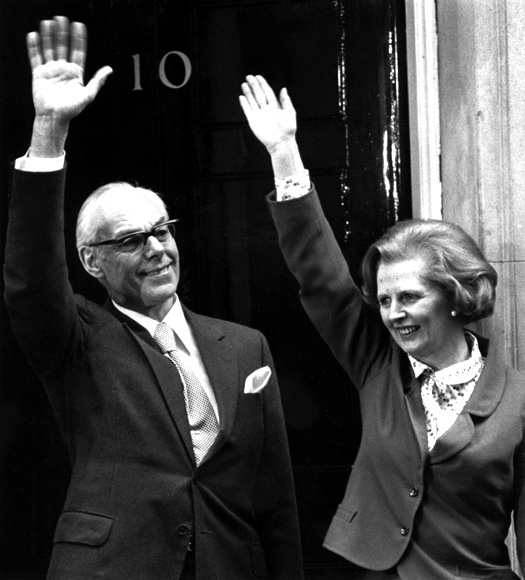 Prime Minister Margaret Thatcher celebrates the 1979 general election victory with husband Denis outside 10 Downing Street. 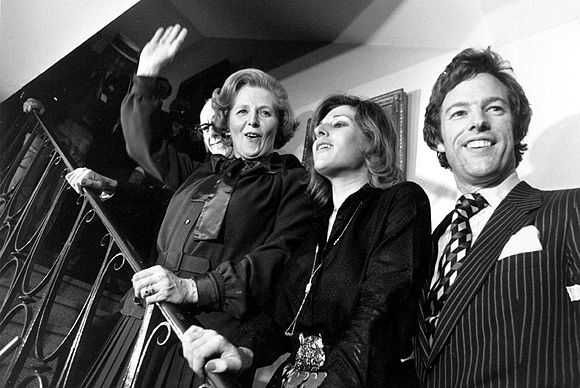 Thatcher, accompanied by her husband Denis and children Carol and Mark, on election night when she led the Conservative Party to victory in the British general election. 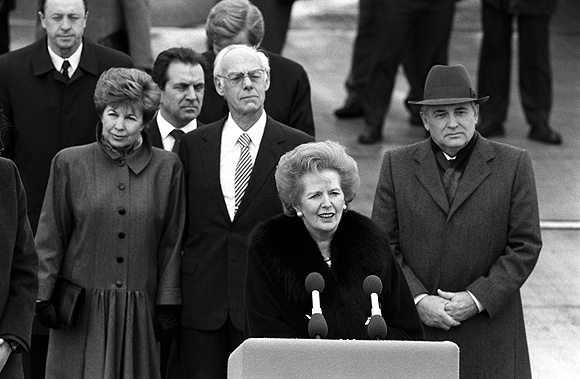 Thatcher speaks as Soviet President Mikhail Gorbachev and his wife Raisa look on at the end of a state visit to Britain on April 7, 1989. Thatcher sits with her new Cabinet at No 10 Downing Street in London. Left to right (standing): Norman Fowler, Transport Minister; John Biffen, Chief Secretary to the Treasury; David Howell, Energy Secretary; Norman St John Stevas, Chancellor of the Duchy of Lancaster; Humphrey Atkins, Northern Ireland Secretary; George Younger, Scottish Secretary; Michael Heseltine, Environment Secretary; Nicholas Edwards, Welsh Secretary; Patrick Jenkin, Social Services Secretary; John Nott, Trade Secretary; Mark Carlisle, Education Secretary; Angus Maude, Paymaster General; and Sir John Hunt, Secretary to the Cabinet. 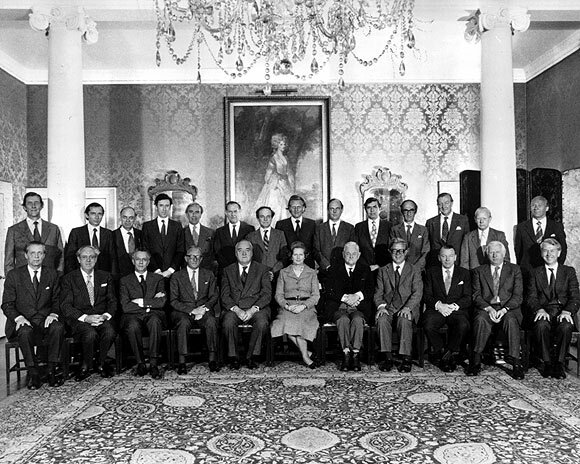 Left to right (seated): Sir Ian Gilmour, Lord Privy Seal; Lord Soames (1920 - 1987), Lord President of the Council; Sir Keith Joseph, Industry Secretary; Lord Carrington, Foreign Secretary and Overseas Development; William Whitelaw, Home Secretary; Margaret Thatcher, Prime Minister; Lord Hailsham, Lord Chancell 8744 Sir Geoffrey Howe, Chancellor of the Exchequer; Francis Pym, Defence Minister; James Prior, Employment Secretary; and Peter Walker, Agriculture Minister. 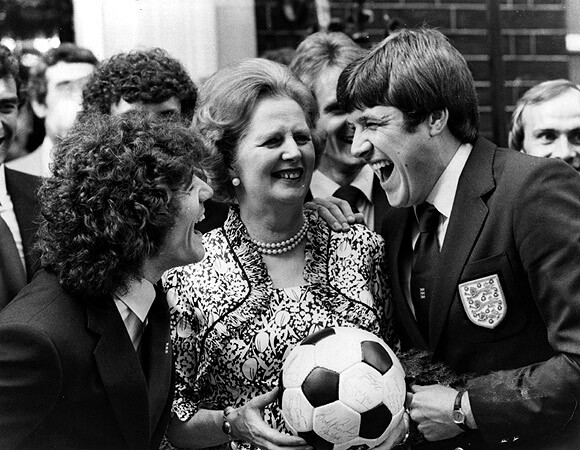 Emlyn Hughes and Kevin Keegan, members of the England Football Squad enjoying a joke with Thatcher outside No 10 Downing Street on June 6, 1980. 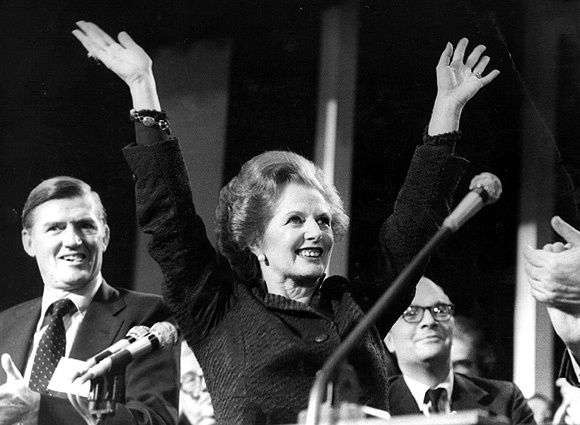 Thatcher celebrating at the Tory Party Conference in 1985. 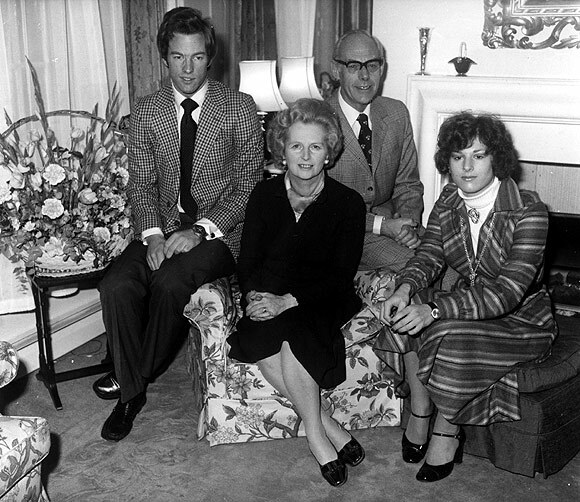 Thatcher with husband Denis and children Mark and Carol in this January 1982 picture. 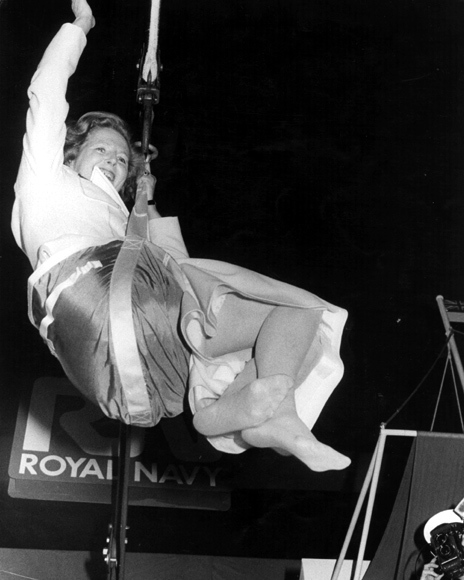 Thatcher, swinging from a hoist during a visit to the Royal Navy on August 16, 1983. 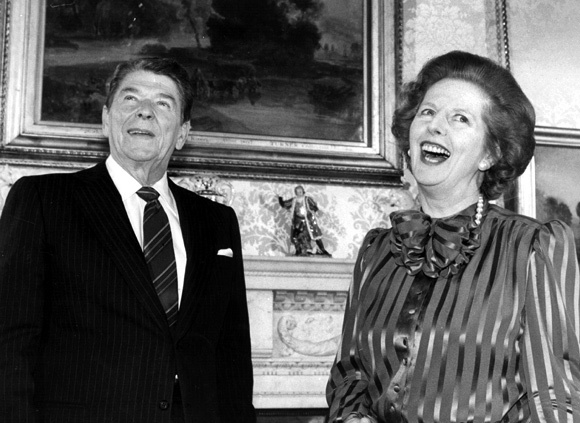 Thatcher shares a joke with American President Ronald Reagan at No 10 Downing Street, London on June 5, 1984. 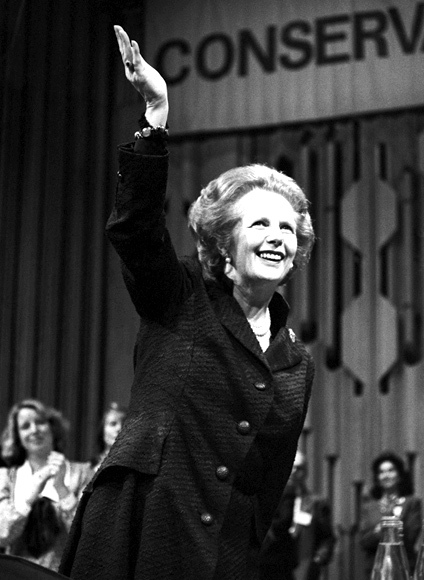 Thatcher addressing the Conservative Party on May 22, 1985. 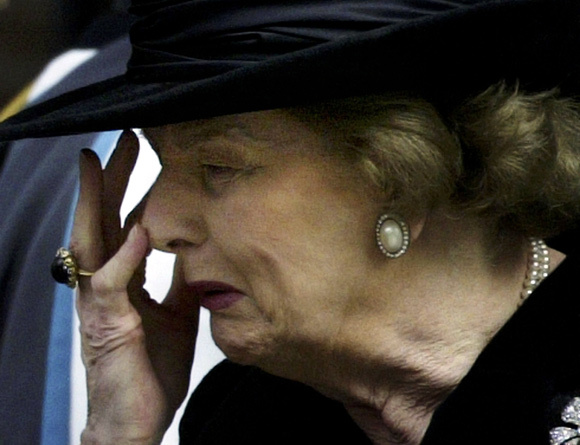 Thatcher weeps as she leaves the memorial service for her husband Denis October 30, 2003 in London, England. Denis died 26 June 2003 at the age of 88. British Prime Minister David Cameron greets Baroness Thatcher on the steps of Number 10 Downing Street on June 8, 2010 in London, England. 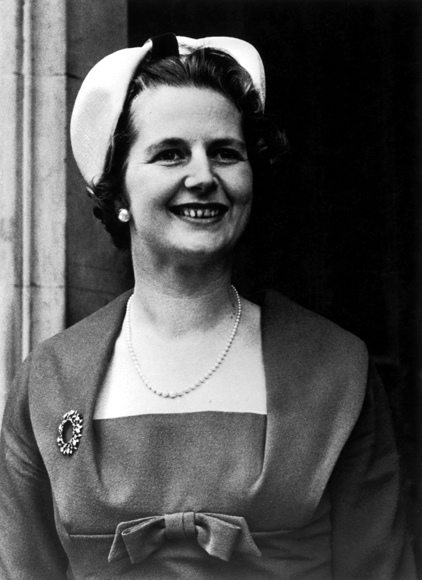 Thatcher served as prime minister of the UK from 1979 to 1990. 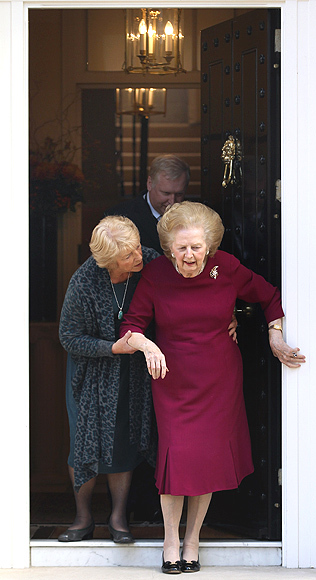 Thatcher is helped to her door to greet the press at her home, after leaving Cromwell Hospital on November 1, 2010 in London, England. 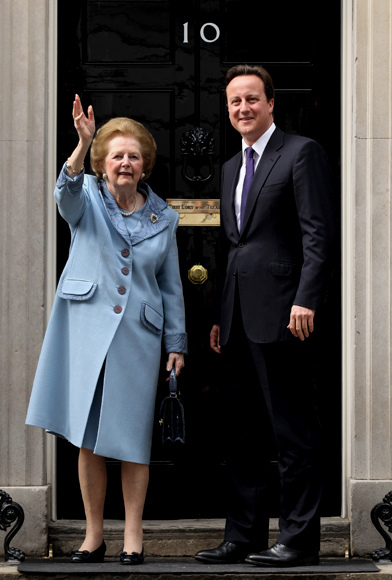 Thatcher missed a party at Downing Street on October 14, 2010 to celebrate her 85th birthday because of her illness.